I shuffled the thread thru at quite a speed, so could have missed if it was mentioned, but no-one seems to talk about the rhs at all. It is all about the impact position and such, which is fine and apropriate, but a really solid kick serve has if not the same, close the same rhs as a flat screamer at 120 mph flat at the top level. Most rec ”kick-serves” are hit with way less speed than a flat effort and the result is a lame side- or topspin serve, if not a darted ball at the service box with some side spin on it. I prefer to tailor advice based on the player. @FiReFTW isn’t lacking rhs so this advice isn’t applicable to him. His main issues are toss location and swing path for his 2nd serve. Interesting how he says "slightly stronger continental" for more pronation. Did not know that. you do have ISR or pronation on both 1st and 2nd serves. your serve looks good. I think the advice above to swing more to the R is good. Also, while swinging more to the R, try to get the tip of the racket head in front - stop the video below of a Federer 2nd serve and see the tip of his racket is slightly forward. Also, the FZB side by side of Salazar kick and slice shows his racket tip is slightly forward at contact. You are still hitting up and to the R but the tip is "closed" a bit. @TennisCJC what do you mean by tip forward? The very top tip of the racket will be closer to the net than your hand at contact. Now, what is the deficit of not pronating on slice serve, if the mechanics gets it done and you get good effective slices? Today I practiced it a bit, toss more back and swingpath completely along the baseline, I almost lost my nerves . =#=%#=%=(#%= kick serve can go "(##"(/%(% itself. This kick serve is seriously the most frustrating and annoying technical stroke ive ever worked on in my tennis life, its FRUSTRATING. Yes, it's FRUSTRATING without a doubt. I will wait to see what you will write once you start practicing backhand slice. ~12% velocity and 20% RPM, if you go by the difference between Federer and Murray. Looking at Kyrgios, the difference is 20 mph. If it works, it works. No need to rush to change it if it's not high on the list of things to improve to get to the next level. Knowing how to use your shots tends to be far more important than how good the shots themselves are. It doesn't mean we should neglect them, but technical deficiencies are nothing more than an additional route through which we can improve our performance on a tennis court. Even a 120 mph slice is a weapon up the ranks, if you place it right. For some reason, his demonstration of the swing path was better than any other I've seen. I can't figure out why. And he's even serving with the wrong hand! In the Salzy video, he mentions that a wider platform stance allows for a better shoulder turn, allowing for more kick. Wider? You mean back foot being more behind? If so then yes im trying to, i think its better than before but not as back as those videos u showed. I agree with S&V that you could direct your energy more to the side rather than toward the ball. Like Nytennis said, though, the fundamentals are pretty good. While top players do pronate on all serves, I don't think there is an equal amount of pronation on all serves. Kick serves will have a little less than a flat serve. One thing that really made my kick serve kick was to stop thinking so much about the technique. I just focused on getting the toss above my head and aiming high over the net. I found that the rest kind of fell into place naturally. Oh, and when I say high over the net, I mean HIGH over the net. I got the idea from a Brent Abel video in which he suggested exaggerating by trying to hit 15 or feet or more over the net. Again, that's just to exaggerate to get the feel. Here's another drill I've seen coaches do: stand at the baseline, but face the back fence rather than the opposite course. Then, try to hit a kick serve over that fence. Again, it's a great way to exaggerate the upward component. Here's another drill I've seen coaches do: stand at the baseline, but face the back fence rather than the opposite course. Then, try to hit a kick serve over that fence. Doesn't that upset the people playing on that other court when you succeed? Perhaps it's the angle but your feet look too far apart. Yeah, back foot more behind. Will keep it in mind, i do it better than before as per ur advice, but not that much, feels akward, will experiment with it some more. I did not read any of the tips. But if you can't hit a kicker just serve exactly the same you have been doing for your 1st and keep body sideways for the kicker. That's it. Don't over complicate things. Then add variation of spin. After you get the basic position. I went through the same phase, it's pretty hard and frustrating to get the kick serve going consistently but once you do, you seldom miss. I know people in my club who just give up because they think its as simple as following Ikea instructions, and they are pretty good players. Repetish repetish and repetish and patience. The way it was taught to me and I guess it did help because it didn't take too long for me to learn it was that first you do it without getting your feet off the floor, just plant your stance and focus on the toss and brushing the ball up like if you were throwing your racket towards the sky, which also helps with the extension. Once you nail that you can put your weight into it a bit with getting your right leg off the floor and into the court (for right handers) but your left foot needs to stay planted on the floor. After than then you can implement the other parts of the serve and lastly get some serious rhs to make it really kick. Its tougher than it sounds, it'll take you a good few hours. I still struggle with getting a consistent wicked kick because I struggle with the wrist action due to having a dodgy wrist but I suspect its more a mental thing as my injury doesn't go to worse but it stings on the ulnar side if I don't hit it proper and it also affects my forehand but I can play through it. Once you hear the sweet sound of the strings snapping on the kick its well worth the effort. Most rec players serve with a pin-point stance stepping up, I think. However the thing is, that instead of stepping in, they step around and lose all the stretch and loaded shoulders before the hitting hand have moved a touch and come around the body, instead of throwing the playing hand up. I think John McEnroe was one of the best slice and kick-servers of all time. He had his back towards the net really late in the sequence. And, he too was a leftie... Rafa’s getting better too. But quite far from McEnroe still. It is no rocket science in skills sports. Every time, you change and try to develop in the technical side, your scores go down. Isn’t Kyrgios a touch taller than all the others mentioned? Ot is also a matte of leverage. I meant Kyrgios relative to himself. He doesn't pronate on his short wide slices, hitting them around 160 km/hr. When he pronates on a serve to the same corner, he hits around 200 km/hr and still gets good action and movement away from the returner. Getting a little better now, baby steps really. Swingpath seems to be going more sideways now, got better feel now, toss location and contact point is still not there, I need to let the ball drop slightly lower when making contact, but its at least going in the right direction. But when i imagine that, in my head it seems even easier to not pronate this way, because coming around like an upside U makes my arm want to curve around like that instead of rotate it away, I dont think this vizualization helps with this. Yeah well its just a visual thing so won't work for everyone. But when I actually attempt it it does two things for me. 1 I hit the ball lower in the swing as I need space to come over it, and 2 I pronate over it with a snap as opposed to excessively "carve" the ball. Might be something to just play around with a bit to see how it feels. No I hold pure continental for all serves, but I will try this to see how it feels, but I wanna get everything else right first, toss, contact location and all before experimenting with grips. But I think continental is fine, lots of players hit with continental. Thats true @IowaGuy I will try it next time, what do you think about the rest? Swingpath looks good no? Ball toss is a bit all around, a few ones was good, and also contact location should be lower. Here are some safe/high-percentage 2nd serves (i.e. can hit 19 out of 20 to the BH side) on a cold, wet day (thanks to the winter Jolly challenge! ), they normally kick a little higher on a warm day. I think my swingpath is a little more sideways than yours, and I have more of a "dirty diaper" finish upon pronation than you do (you can see it in slow motion). Your 2nd serves are a little more pace but maybe not as spinny/high margin of error? Can you hit 19/20 of your 2nd serves to your opponent BH? Yep yours have more spin less pace, you can also hear the strings grate the ball more. Nice kick on that 2nd one! Placement is of 2nd importance now, apart my 1st serve which is good enough now to start target hitting and improving placement. But on my 2nd i still want to make it better and more consistent first so its very solid, then start working on placement. As your toss improves, you will gain consistency. Also, IMHO, spinny/less pace = more consistent. 1) Angle between the forearm and racket face - for internal shoulder rotation (ISR) to accelerate the racket head there must be an angle - that rapidly changes for the serve - between the forearm and racket shaft. 2) Impact of Racket and Ball. The path of the hand; the forearm to racket angle; the path of the racket face; the impact location; all have to work together so that the ball and racket face meet with the correct angles on the racket face to impact and direct the ball. The racket face angle, in mostly the side-to-side direction depends on the rotation angle achieved by ISR at impact. The ISR angular rotation rate may be roughly 3 d. per millisecond. The angle that the racket face faces is changing rapidly from ISR and the closing angle changes rapidly also so that there is probably a lot of variety in the motions being used for getting similar appearing ball impacts and trajectories. The forearm to racket angle vs time can vary for different servers and probably also among their serves. This Toly composite picture illustrates the angles of the hand path, racket path and ball trajectory and other details. The red arrows show roughly when ISR starts to impact. There is more than one way to get the racket to the position shown at impact. Another informative Toly composite picture from video showing the many 3D angles in the serve. 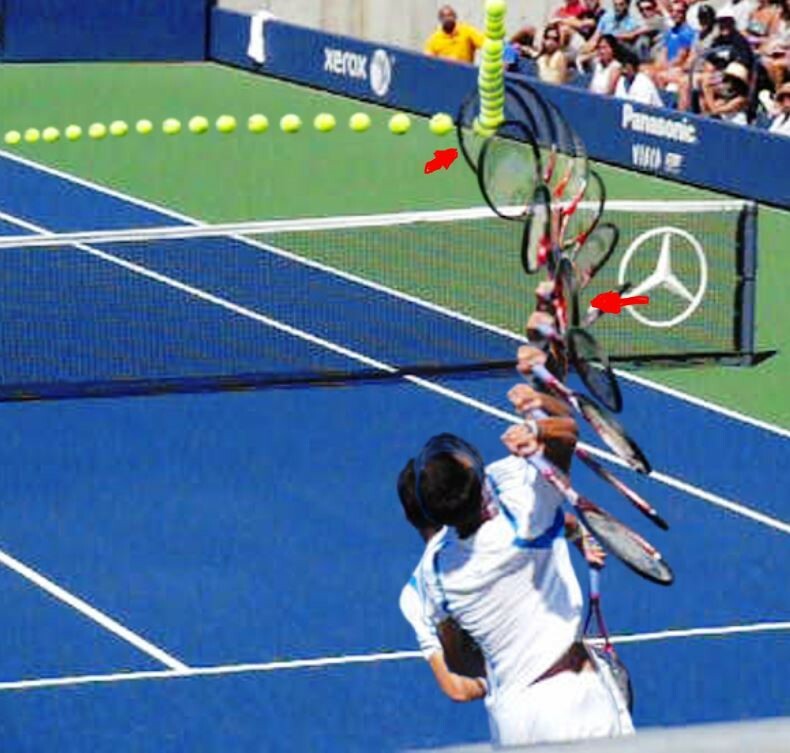 Note that at impact the horizontal direction of the trajectory will depend on the racket face angle at impact as produced by ISR and pronation. I believe that for a Waiter's Tray the racket approaches the ball at a different angle, more straight, and that this may be the source of problems in changing. WT serve videos of similar views might answer this important question. Best to evaluate these issues by comparing unknown serve techniques to known high level serves using high speed video and very similar camera angles. Some impacts have a very clear angle between the forearm and racket shaft. This is the fastest and most significant racket motion of the serve. It requires high speed video with small motion blur. Cameras produce 2D images only, so the camera viewing angle must be selected to show the serve angles that you are interested in. a. Your had good pace in the video, but it lacks spin, therefore it might go out a lot more often than you think esp. under pressure. I suggest add a bit of topspin in your flat. You are also relying on your body + arming to hit the ball a lot, if you are tired or not in the right mood it will go out a lot, hitting the net, etc. b. Try to get your ball to contact above your head. a. Your swing path is the same as your flat, to kick you need to have a slight upward motion slightly tilted to the right of where you want your ball to go. To do that, you have to have your contact point behind your head, and a bit lower as well. That's all. Let me know if this helps. Edbergs wrist is heavily flexed, interesting. Yup, he has what Salzy calls the "dirty diaper" finish. Ok guys, need some help, my 1st serve has reached a pretty decent level where im satisfied with it, of course im going to keep improving it, don't get me wrong, but its the one shot that is my biggest weapon, so currently my priorities are other things, but I will still work on it alot in the summer by target practice etc.. Anyway, my biggest priority currently (considering im starting to play leagues and tournaments in summer) is getting my 2nd serve in check, before a ton of match play makes my technique ingrained too much, so I have a good technical fundation to build on. Was just wondering what you guys think I need to improve with my kick serve, its not consistent at all yet, I need to make it consistent so I can hit 99 out of 100 and that they are quality ones. I was focusing specially on letting the ball drop lower like J011y suggested a while ago, but im not sure if its right or it should be even lower. It does seem to kick to the right, but something is not right, I feel like, it seems too have not enough brush maybe and too much drive perhaps. Also one big issue I see that I want to fix, is pronation, im pronating on my 1st serve after contact, but on the kick im not at all, and all good servers do, what do you think is causing this? Pronation on the 1st serve, bu lack of pronation on the 2nd serve? Anyway im open to all suggestions about what to try, and also how to fix my pronation problem and if I should go step by step im willing to do that for sake of fixing it and really building a good kick serve. Here are the videos comparing my 1st and 2nd serve, my 1st serve was slice down the T, and my 2nd serve was kick (or at least an attempt to hit kick lol... well I do feel its kind of a kick as it kicks right, but idk seems like too much drive and not enough spin, maybe some sort of aggressive kick). I'd relax your 2nd serve motion. Swinging too hard and fast and forward on it. Should really be a big roller... imo Is still too flat and like your 1st. Guessing you get inconsistent kick action. Big loop up and over I like salzenstein vid for that. Also Sound off strings should be more of a sharp chuff sound, not a pop.